A list of all the ancient Greek cities in Sicily which minted coins with examples of them. The ancient Greek Island of Sicily has a variety of history and amazing coins to explore. Some of the cities had some of the rarest coins possible. The best standard reference work on the subject of these coins is Handbook of Coins of Sicily by Oliver D. Hoover. I cite coins from this book quite often, as HGC 2, (and the coin number). It is full of history and a variety of types not usually seen anywhere. I highly recommend it. Over the years I have had a collection of thousands of ancient Greek and Roman coins that is over 13,000 items now. This inventory includes some very rare coins from many cities of Sicily. People don’t know exactly what to search for. There are limited amounts of ancient coins available. There is not a lot of information that can help a beginner collect this series. There is usually not one source that has many of the rare types available. This article is to provide people with solutions to this issue. My name is Ilya Zlobin, and I am an expert, enthusiast, author and dealer in ancient Greek Roman Byzantine and even world coins and medals. The reason for this article is that I believe an educated customer is the best customer, as only someone that knows about a specific subject can appreciate the value and beauty of it. I have many articles and videos on many subjects, teaching about different ancient coins. It took me years of experience to have the inventory I have available for you to explore. When you deal with me, you are leveraging my vast experience of working with over 53,000 items over the years. This article is full of links to the specific coins and cities and the coins shown here are ones available in my eBay store at the time of the writing of this article. You can use the links to search my store for the specific items, of which I have many. Some links may or may not yield results, but may in the future. So in other words you can use this list in order to put together a collection, or check back at later dates for certain cities. You city names are quite hard sometimes to spell so it is another way it is really helpful. 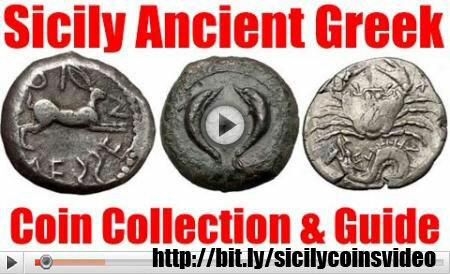 Click here to see all coins of ancient Sicily I have available. This list of ancient Sicilian cities is comprehensive, including some of the super rare mints which are usually not seen. If you decide to put together a collection, you can click on each of the cities below of your interest and search my eBay store with over 14,000 items for those specific coins. You can also use the list below for your own searches. Bronze 18mm (3.38 grams) after 210 B.C. Radiate bust of Apollo right, wearing chlamys. AITNAIΩN, Warrior standing facing, head right, holding spear and shield; three pellets in field to left. The Syracusan colonists expelled from Katane in 461 B.C. founded a new settlement about ten miles to the north-west, ad to this place they transferred the name of Aitna which they had previously bestowed upon Katane. Silver Hemidrachm 15mm (1.84 grams) Struck circa 420-406 B.C. Eagle standing right on hare; barley grain to left. Crab; below, ketos left with fish in its mouth. Bronze 22mm (9.01 grams) After 210 B.C. Wreathed head of Persephone right. AKPAIΩN, Demeter standing left, holding torch and sceptre. Bronze 15mm (2.63 grams) Struck circa 400 B.C. Bearded head of Hercules right. Bronze 30mm (26.95 grams) Struck circa 340-330 B.C. AΘA, Head of Athena in Attic helmet right. Female figure enthroned right, holding palm branch or scepter and grounded bow; all within incuse circle. * Numismatic Note: This mint’s name has been previously misread as AΘΛ (Athl), in light of modern numismatic scholarship, AΘA is actually a Doric abbreviation for Athena. So therefore, the name of this mint is unknown. What is known is that the larger bronzes were re-struck on Syracusan issues from the period of 375-345 B.C. Bronze 11mm (1.56 grams) Struck circa 400-330 B.C. Bronze 15mm (2.90 grams) Struck circa 339-310 B.C. ΓΕΛΩΙΩΝ, Head of Demeter three-quarter face to right, wreathed with corn. Bearded head of river-god Gelas left, horned, and wreathed with horn. Bronze Hemilitron 24mm (15.98 grams) Struck circa 450-420 B.C. * Numismatic Note: Fantastic coin in the most fantastic condition you can find, especially such a rarity! Bronze 19mm (7.30 grams) After 210 B.C. Veiled head of Hyblaia right, wearing modius; behind, bee. ΥΒΛΑΣ ΜΕΓΑΛΑΣ, Dionysus standing left, holding kantharos and scepter, panther leaping up at feet. Bronze 17mm (2.26 grams) After 241 B.C. Laureate head of Zeus left. Bronze 23mm (8.72 grams) Struck 360-340 B.C. Griffin running left; grasshopper below. Horse prancing left, reins loose; star above, KAINON in exergue. Bronze Trias 15mm (3.36 grams) Struck 413-405 B.C. Head of Athena left, in crested helmet ornamented with wing. KAMA – Owl standing left, head facing, holding lizard in right claw; in exergue, three pellets. Bronze 12mm (1.93 grams) Struck 413-404 B.C. AMENANOΣ, Horned head of young river-god Amenanos left. Winged thunderbolt dividing small K – A. Bronze Hexas 17mm (3.95 grams) Struck 211-200 B.C. Bust of Demeter right, wreathed with corn; behind, tripod. KENTOPIПINΩN, Plough right, bird right on the share; two pellets in field to left. Bronze 13mm (2.26 grams) Struck 344-336 B.C. Reference: Calciati pg. 371, 3; SNG ANS -. Head of Hercules right, wearing lion’s skin headdress. Silver Obol 12mm (0.49 grams) Struck 475-466 B.C. Bronze Quadrans 17mm (2.64 grams) Struck late 2nd Century B.C. MENAINΩN, club; mark of value, three pellets below. Silver Tetradrachm 26mm (17.38 grams) Struck circa 480-461 B.C. Reference: SNG München 363 var. ; Caccamo Caltabiani 218, 97 var. ; Randazzo 59, 162 var. Charioteer driving biga of mules right; leaf in exergue. Laureate head of Ares left. of his horse standing left behind him; Π in field to left. Silver Hexonkion – Hemilitron 8mm (0.18 grams) Struck circa 461-430 B.C. Head of Dionysus right, wearing ivy wreath. Kantharos; six pellets around (mark of value). Bronze 23mm (9.99 grams) Struck late third-early second centuries B.C. ΠΑΝΟΡ/ΜΙΤΑΝ, Head of Athena in Corinthian helmet right. Head of Persephone left, werated with grain. Bronze 32mm (34.09 grams) struck circa 340-330 B.C. ΠΕΤΡΙΝΩΝ, Head of bearded Zeus right. Aphrodite enthroned right, holding dove. Not much is known about the settlement, although it could be believed it was fortified as it’s name translates to “the Rock”. Numismatic evidence locates the city to have been located in the area of northwestern Sicily, and that it was founded before circa 350 B.C. The city gave itself over to Roman control in 254 B.C. during the First Punic War. The community survived until the second century A.D. Bronze Triantes 19mm (7.95 grams) Struck 410-400 B.C. Head of Aigiste right, wearing sphendone. Hound standing right, four round punched value marks around. Bronze 12mm (2.17 grams) Struck late second-early first centuries B.C. Bronze Litra 30mm (31.71 grams) Struck 344-336 B.C. ΣΥΡΑ, Head of Athena left, wearing Corinthian helmet bound with olive-wreath. Agathokles ( Agathocles)- Tyrant of Syracuse 317-289, King of Sicily 304-289 B.C. Bronze 23mm (9.04 grams) Struck circa 317-310 B.C. ΣYPAKOΣIΩN, Head of Persephone left, wreathed with grain; symbol behind. Bull charging left; dolphin above and below; NK monogram above. Bronze 20mm (7.13 grams) under king Hieron II, 270-215 B.C. Head of Poseidon left, wearing tainia. Ornamented trident-head, between two dolphins, dividing IEPΩ – NOΣ. under Hieronymus – King: 215-214 B.C. Bronze 22mm (8.97 grams) Struck circa 215-214 B.C. Reference: Sear 1224 var. ; Calciati 204 R 13. R.R. ; Holloway, The Thirteen Months Coinage of Hieronymus of Syracuse, 76a; SNG ANS 1038. Diademed head of Hieronymos left, beardless. ΒΑΣΙΛΕΩΣ / ΙΕΡΩNYMOY above and below winged thunderbolt, above and below which T A. Bronze 23mm (7.26 grams) Struck 275-212 B.C. Laureate head of Apollo left; behind bee. Bronze 20mm (6.41 grams) Struck second century B.C. Bearded head of Hercules wearing the lion skin headdress right. ΘEPMI/TAN, Tyche standing left, holding phiale and cornucopia. Bronze 22mm (8.38 grams) Struck circa 254-214 B.C. ΣΩΤΗΡΕΣ, Dioscuri charging left on horseback. Cool article pertaining to world coins. World-renowned numismatic expert published this to educate people.